During the occasion, Hong gave a detailed explanation to his US counterpart of Korea’s three major economic agenda — the US’ Section 232 on auto tariffs, the extension of an earlier exemption from Washington’s sanctions on Iran, and the US’ upcoming foreign exchange report, he explained. 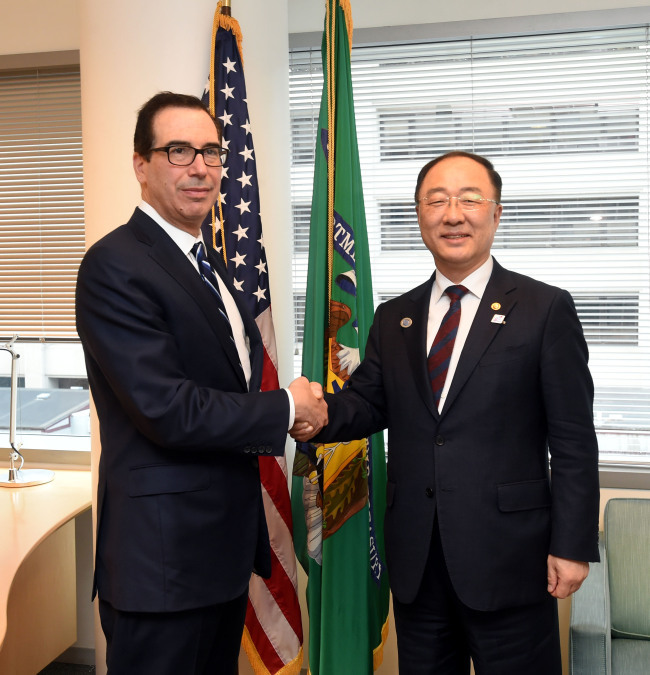 During his stay in Washington, Hong also met with representatives of the top three credit ratings agencies — Standard & Poor’s, Moody’s Investors Service and Fitch Ratings. Citing the recent inter-Korean and US-North Korea talks, he asked them to factor the improved peninsular security situation into Korea’s sovereign rating,.